Found Fall 2002 while deer hunting. Nice and heavey 4×5 that’s chewed up. justin, my guess is that this is a cougar kill. 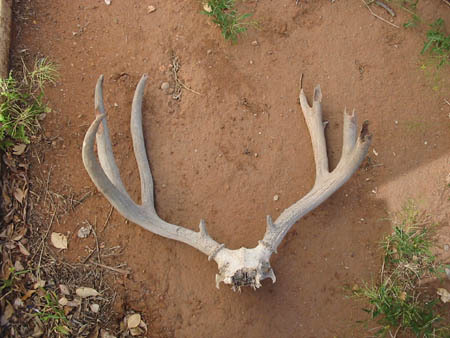 Many hunting websites associate finds like these (skull intact) as sheds. Everybody knows its not an actual "shed". NOT ALWAYS A PREDITOR KILL SOMETIMES YOU JUST LOOSE ETHEM AFTER THE SHOT AND THEN THERES THE GUYY WHO SHOOT AND IF IT DOESNT DROP RIGHT THERE THEY DONT TRACK IT. antlers like those there hot!!!! !